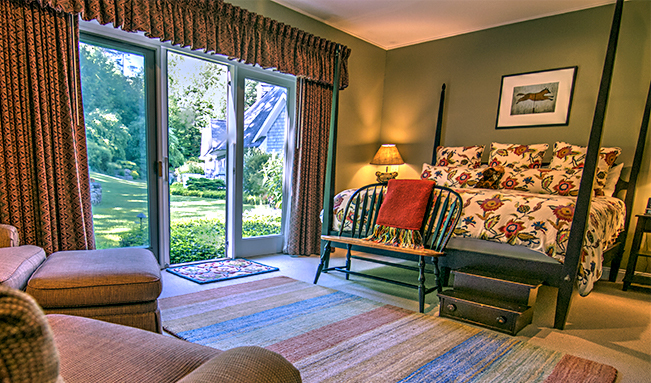 Stone Hill Inn — soft, quiet, undisturbed. 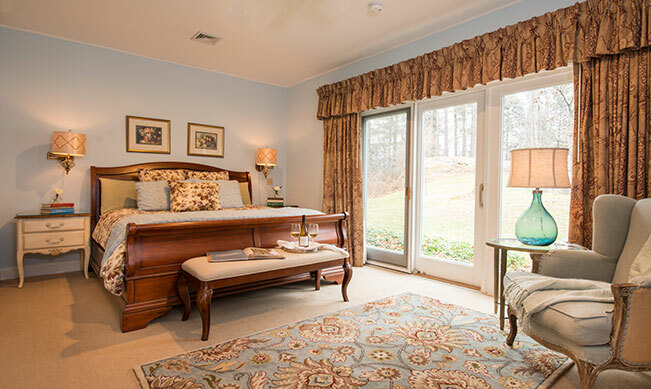 Providing for the comfort and privacy of couples with private tables at breakfast, relaxation in 2000 square feet of common areas, carefully crafted guest rooms, and nine acres of woods and gardens. Surrounded by trees and hidden from traffic fifty feet above the mountain road, Stone Hill Inn with its own private drive boasts a comforting seclusion. Yet, it is centrally located to the myriad outdoor activities that give Stowe its reputation for Vermont vacation excellence. 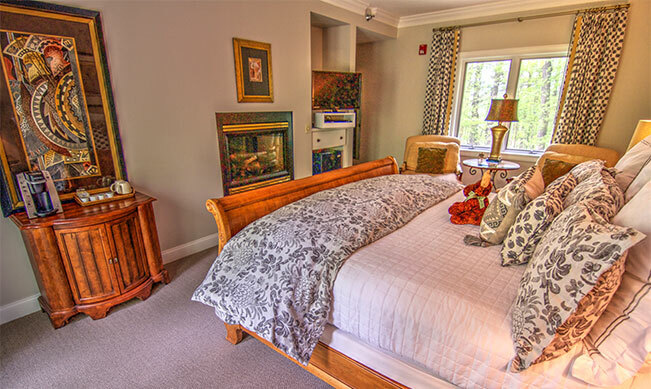 Come to the Stone Hill Inn, the leader among Stowe bed and breakfasts, and we’ll help you find opportunities to celebrate life…together. 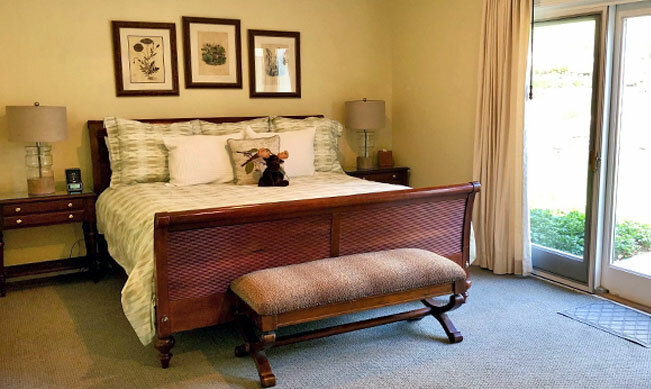 Relax in a carved, country-French sleigh bed with room tones of bronze, sage green, cream, and soft peach. 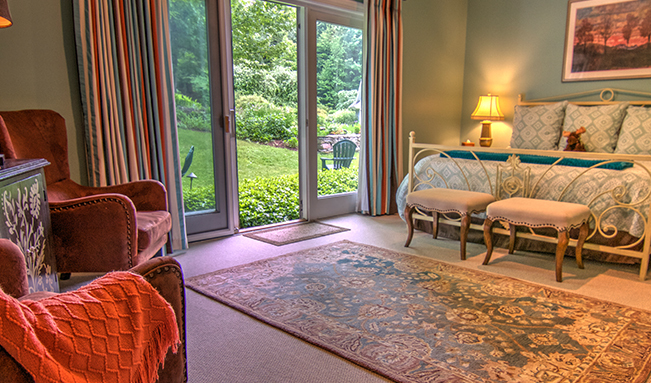 Step outside and enjoy relaxing on your new isolated patio surrounded by woods next to the southern perennial gardens. At the end of the north wing you will find Fiddlehead. 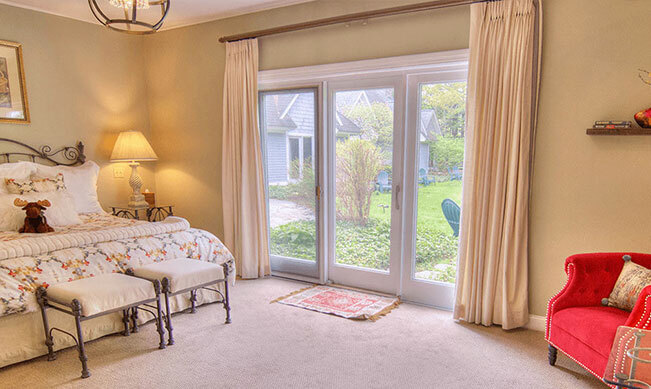 Nearly 500 square feet of space and very private. 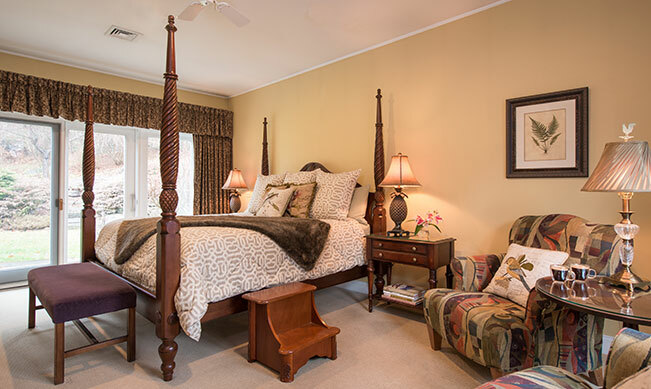 Relax in a room freshened by Picasso, overstuffed chairs -- a counterpoint to the old-world European charm of a massive plantation four poster bed dressed in rich moss, Bordeaux, and gold. The new sleigh bed with its tones of dark cherry create a canvas tinted with blends of fawn, fern green, deep wine and grey blues. Oversized chairs make it easy to relax, even as the new, misty, sky blue hue of the bath beckons. 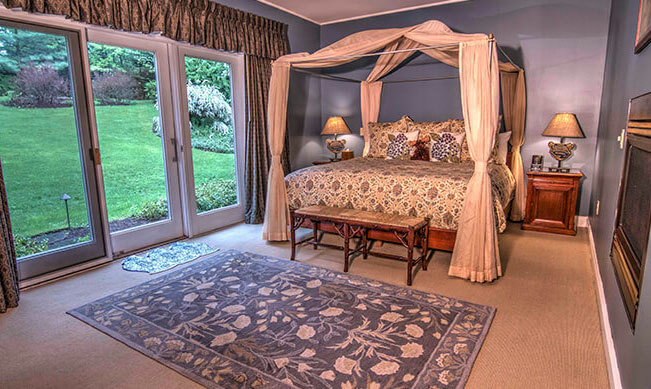 The dramatic canopy bed is the centerpiece of this room accented by flowing fabrics of indigo and honey. 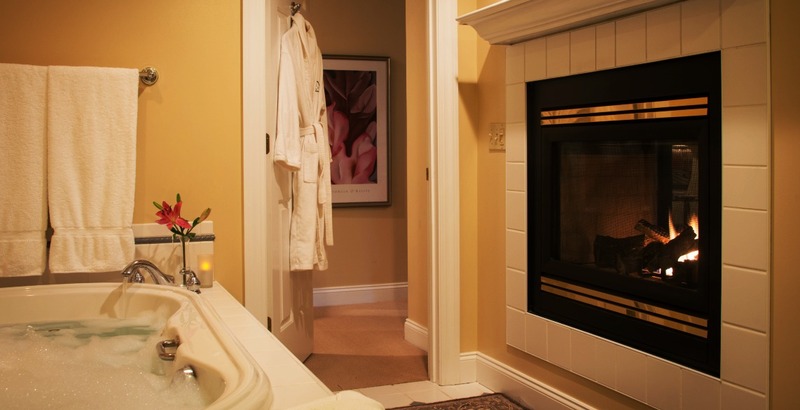 Come, experience an intimate Stowe, Vermont romantic celebration. The handsome mahogany finish of Sterling’s sleigh bed and new bench combine with updated fabrics in deep lavender, rich aubergine, and forest green. Enjoy outdoor seating on the stone patio as you exit your room. 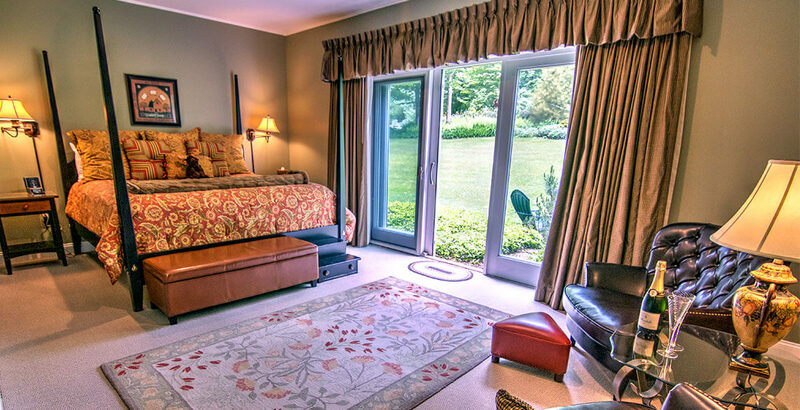 This restful retreat warmly welcomes you with its black, pencil post bed and garden-inspired style. Oversized chairs and ottoman make this the perfect place to relax, watch a movie or enjoy the serenity of the southern gardens and waterfall. A fresh palette of gold, caramel, tomato and sage in textures of florals and stripes adorn the contemporary, black, pencil- post bed. Enjoy our recently updated Moss Glen. A fresh palette of Covington Blue, Cream and Brown compliment new suede chairs and fabulous wool rug. Relax and unwind in style. 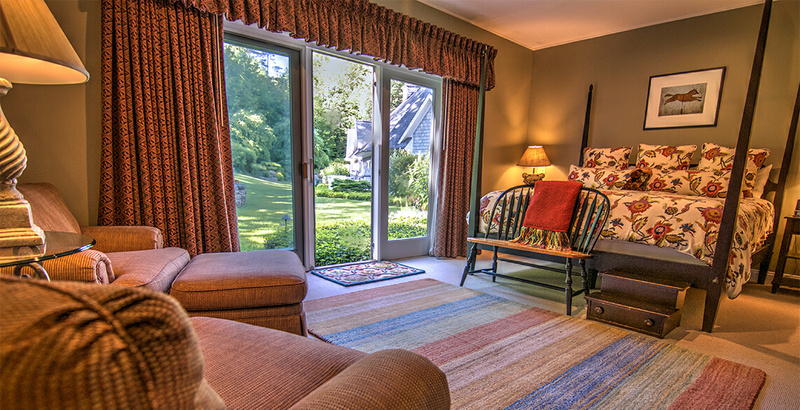 Enjoy Stowe lodging at its best. Immerse yourself into the graceful curves of the scrolled iron bed with garden-inspired fabrics of garnet, sage, and ivory. Listen as you step outside to hear the soft splash of the streams as they make the 80 foot journey to the pond. Learn more about accessibility. Book direct for the best experience and the best rate! Want to know where each room is located? 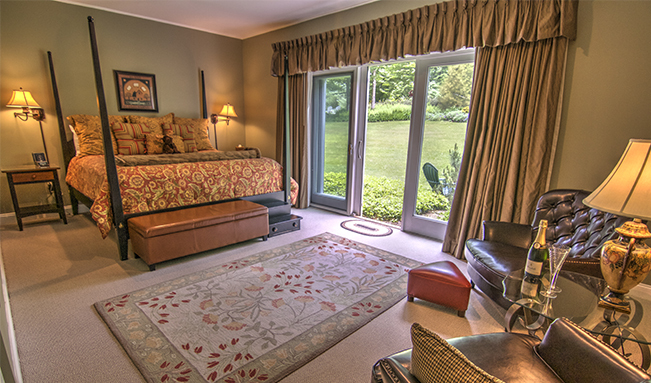 View our luxury Bed and Breakfast facility map. 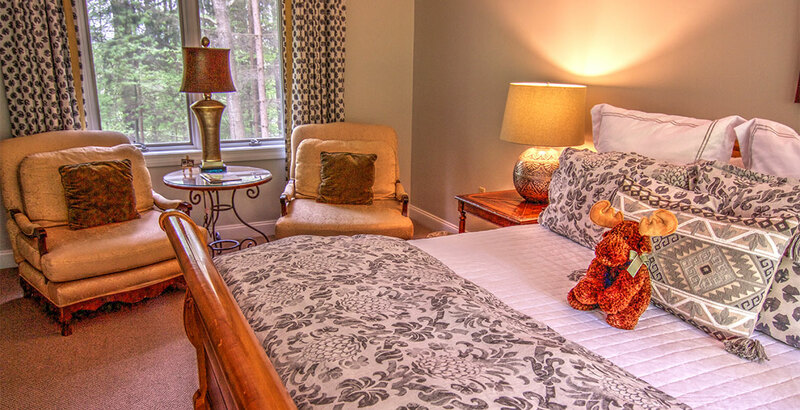 Be sure to review our special and packages — experiences that enhance your moments of shared discovery at at our Stowe bed and breakfast . This year give her the #bestgiftever with a trip to Stowe. Gift Certificates available, too. Don’t forget, Mother’s Day is Sunday, May 12.